HOUSTON (KTRK) -- Houston's Free Press Summer Festival kicked off today for the first time at NRG. Organizers were forced to switch venues after the floods damaged Eleanor Tinsley Park. Music fans were warned the heat could be a problem at NRG, and unfortunately that proved to be true for several people. 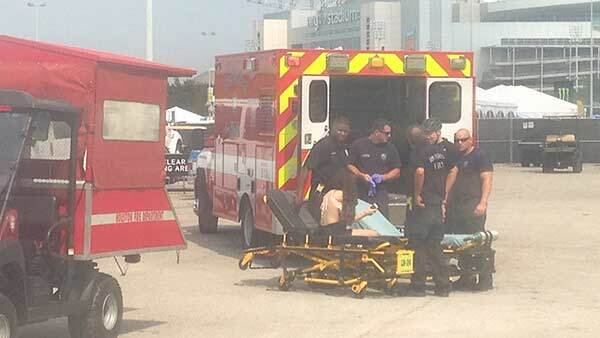 HFD had at least 57 emergency calls at the event dealing with heat related illnesses. Raymond Luna comes prepared. He packed everything from a water jug to baby wipes. "I've got this, the sunscreen the hat, umbrella and the chair," Luna said, "And those porta- cans get pretty dirty." Festival organizers set up a free water station where fans can fill up water bottles. "This is my first free press and all my friends told me, like, Cam, don't pass out on me because it's gonna be hot," Cam Durley said, "They said make sure you have some water and you'll be good." EMS teams have been busy, though, picking up fans who passed out from the heat and carrying them by golf-carts to ambulances. Luna advises anyone coming out Sunday to take his advice and drink lots of water. Free Press Summer Festival 2015 has a fresh music lineup isn't the only major change at the two-day event.